Earlier this week, Catherine Zeta-Jones gave us a quick tour of her personal walk-in closet via Instagram, and it's just as dazzling as you might imagine. There's even a special section reserved just for her Hermès scarves, and a surprising amount of Chanel bags. This is mostly surprising because CZJ is even more of a celebrity Birkin enthusiast than most celeb Birkin enthusiasts. They are her preferred travel bag, and she frequently decorates them with scarves from her collection. Here she is clad in fur, carrying a treasured black Birkin with gold hardware while running errands in NYC. This is a very recent shot of Catherine outside of JFK with what is quite possibly the same Birkin. As you can see, it has its own Hermès scarf and a gray shawl just like hers. The entire fam looks extra glamorous here traveling as a pack at JFK. That's her husband Michael Douglas behind her, and her two children, Dylan and Carys, flanking her at her right and left. She's also carrying a gorgeous, glittering Chanel Flap Bag in addition to her supple, pebbled leather off-white Birkin. And here's another light-colored Birkin (although not the same one), this time at LAX. She's also carrying a Louis Vuitton computer case. Here she is back at JFK with her mother Patricia (also a huge fan of scarves!) and a pebbled black leather Birkin. That looks like more Chanel on her other arm. This beautiful taupe Birkin with silver hardware is laden with luxurious shawls. It suddenly occurs to me that I don't own nearly enough shawls. One more time back at JFK with her favorite black Birkin, accented with a brightly colored Hermès scarf. As you might've noticed, Catherine is a big fan of all-black. Finally, here she is out shopping with an extra luxe, bright red exotic Birkin. What, you thought she wouldn't have at least one exotic? Presenting the newest Hermes Silver Constance Bag that’s released in store now. If you’re lucky, the SA has one in stock. If not, you need to hunt in another boutique. The shiny-effect is not only beautiful, but also luxurious. The timeless design features the stunning ‘H’ logo on the front flap. 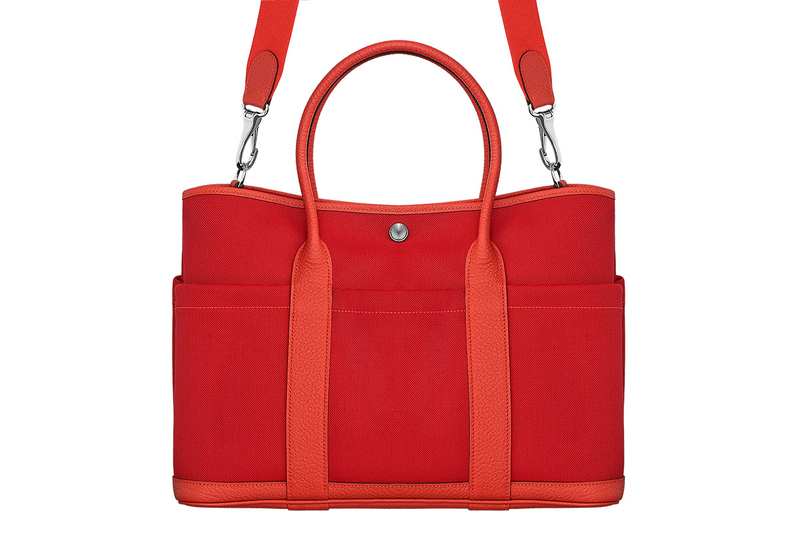 And it comes with a leather shoulder strap to carry on your shoulder or cross body. The Hermes Silver Constance Bag is ideal to go from day to night. It’s glamorous when you pair it with a matching dress and pumps while traveling from city to city. And you will love it even more when carrying it in Paris, on a sunny day sitting on the terrace, sipping a glass of whine. Today we are going to speak about an outrageous priced handbag, one that costs more than some people spend to buy a new house. This purse is called Hermès Birkin Himalayan crocodile and its price tags says $300,000. We are accustomed with Hermes’ staggering prices and the incredibly long waiting list for buying one of their Birkin bags, but this is just insane. No doubt about it, it is the most expensive Hermes purse so far. I have to admit that the handbag is stunning and that it has a couple of very important qualities that kind of justify why someone who is rich would spend that much on a bag. The Himalayan crocodile purse measures 30 cm and it is one of the rarest models on the globe. The product is hand made from Nilo crocodile skin in a discrete color that is reminiscent for the imposing Himalayan mountains. This shade is obtained through a special dyeing process that takes a lot of work and time. To match the subtle color of the leather, the bag comes with 18 karat white gold hardware decorated with white diamonds. The iconic cadena lock of the Birkin is manufactured from 68 grams of 18 k white gold and studded with 40 white round diamonds. The overall purse has over 200 diamonds on its three different structural elements- the Plaques de Sanglons, the Pontets and the Touret. The Hemes Birkin Himalayan crocodile bag was created in a limited number and was offered to a very short list of VIP clients. This very significant detail increased the purse’s value on the resell market so currently to acquire this model that is no longer in production thus not available for purchase you need to pay over $432,000. Hermes is the only handbag manufacturer that can sell on the secondary market at a higher price than its retail price. People describe this jaw-dropping Hermes as one of the rarest and most desirable handbag in the world. And making one involves extensive work. It took a Hermes artisan about an year to craft the purse and the brand guarantees its sturdiness by vowing to repair it any scratches or damages immediately. Considering the scandalous price I seriously doubt that anyone would ever wear or handle the bag without extreme care. I, for one, would keep it on a pedestal if I had one. Kim Kardashian, Victoria Beckham, Tamara Ecclestone and Marjorie Harvey are just a few of the celebrities that own this much-sought after purse. A couple of very interesting thing about Victorian Beckham and Kim Kardashian who are huge fans of Hermes Birkin bags. Victoria Beckham has a collection of Hermes purses that is estimated at over 2 million dollars while Kim Kardashian has so many Birkin that she uses one for the gym and has another one that has been hand painted by her daughter to look more interesting. For those who are not familiar with the price range for a regular Birkin, the most ‘inexpensive’ version costs about $10,000. So there you go gals, if you needed something to treat your eyes with then you have certainly found it. The Hermes Birking Himalayan crocodile purse is a spectacular model that is manufactured from rare crocodile skin and is decorated with 18 k white gold and white diamonds. It is a luxurious bag that is available only for Hermes’ elite.